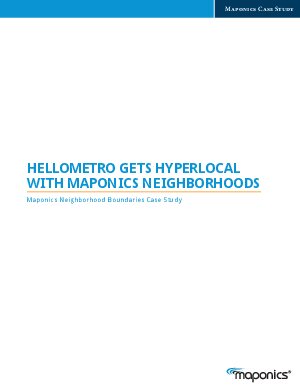 This case study tells the story of how HelloMetro, a network of more than 1,600 city guide web sites and mobile apps, used Maponics Neighborhood Boundaries and ZIP Code Boundaries to organize their vast array of local content, make it more search-able and relevant to users and increased traffic and revenue as a result. HelloMetro needed a way to segment geocoded content, including everything from points of interest to news stories at a local level within large metro areas. They used Maponics geographic datasets across cities in the US and Canada to organize and present content in a way that resonates with web site users, and as a result, increased web traffic my 10% and is growing at 30% per year-half of which they attribute to presenting content at the hyperlocal level.